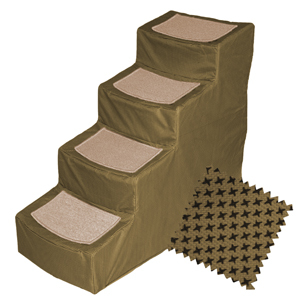 A designer 4 step pet stair for pets up to 150 Lbs. Goes together without tools. The most important feature of these designer 4 step pet stairs is the size of the step. They are wider and deeper. This means an easier climb for both large and small dogs. The innovative incline of each step reduces the amount of stairs needed to climb eliminating stress on your pet. Carpet treads to reduce slipping are removable and machine washable. Top step depth 9.5", 2nd step depth 9", 3rd step depth 8.5", 4th step depth 8.5"